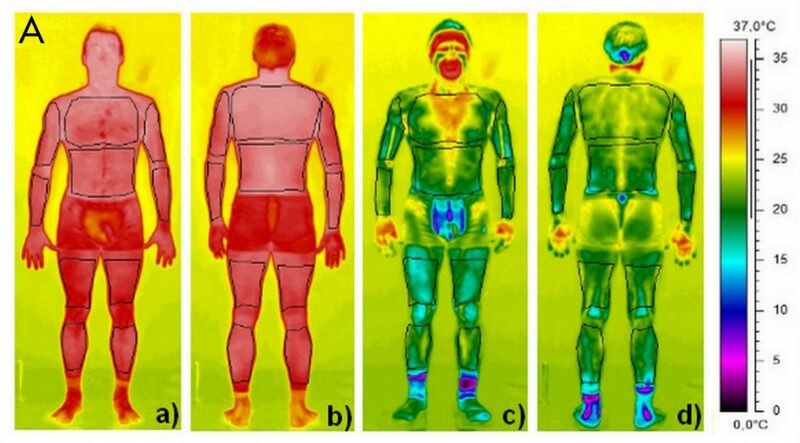 Examples of thermograms obtained immediately before (a,b) and after (c, d) a partial-body cryostimulation (PBC) session (Group B) and a whole-body cryostimulation (WBC) session (Group A). A study by Dr Hausswirth, et al. (France), 2013 has compared electric cooled air, walk-in chamber(s) to liquid nitrogen cooled saunas. Conclusions of the study are that WBC (Whole Body Cooling) is much more significant than PBC (Partial Body Cooling) in the activation of the autonomic nervous system (ANS), the system responsible for nerve function and cellular activation. Thermograms below show the measured skin temperature differences from a walk – in chamber (Group A) (-166F) to a cryo sauna (group B) (-256F). Outcomes prove that treatment effect is a direct result of uniform skin temperature reductions. WBC was statistically and significantly better in activation of the ANS and as measured by modulation markers in the blood (epinephrine, norepinephrine, and dopamine). Temperature comparisons of the systems are irrelevant. Skin temperature reductions during treatment exposure (measured in the neck, chest, and quadriceps regions) are the markers of treatment benefit.